Vatican II (11 October 1962 — 8 December 1965) issued the Decree on Ecumenism (Unitatis Redintegratio) on 21 November 1965. In the decree the council stated: “The restoration of unity among all Christians is one of the principle concerns of the Second Vatican Council” (par. 1). This decree made ecumenism an integral part of the work of the Catholic Church. The Pontifical Council for Promoting Christian Unity is part of the Roman Curia and is responsible for maintaining relations with non-Catholic churches and communities and for sponsoring dialogues with them. Its current president is Cardinal Kurt Koch, former bishop of Basel, Switzerland. The Joint Working Group between the Catholic Church and the World Council of Churches (Geneva, Switzerland) engages in discussions with Orthodox and Protestant Christians who are members of the World Council of Churches. Among other things, the Joint Working Group helps prepare the theme and text for the annual observance of the Week of Prayer for Christian Unity (18-25 January). The Week of Prayer is observed by Christians all over the world. The observance of this week was started in 1908 by the Rev. Paul Wattson (d. 1940), founder of the Friars of the Atonement and influential in the founding of The Catholic Near East Welfare Association. Many dioceses throughout the world have an ecumenical officer who is responsible for local relations with other Christians. This includes local dialogues, prayer services and common community activities. In recent years, the ecumenical officer is also responsible for relations with non-Christians. In an examining room at the Mother of Mercy Clinic in Zerqa, Jordan, Dr. Ibrahim Ghabeish puzzles over a patient’s condition. Somehow Salah, a 3-day-old infant, has contracted dysentery. The infection is relatively common among adults in Zerqa; usually it is contracted by consuming food that has been contaminated by dirty water. But how could an infant, whose only nourishment is his mother’s milk, get infected? After questioning the child’s 25-year-old mother, Maha, Dr. Ghabeish put together a likely scenario. Established in 1982, Mother of Mercy Clinic offers a wide range of general heath care services to thousands of patients — over 26,000 in 2008 — regardless of creed or origin. The clinic, however, specializes in prenatal and postnatal care, giving priority to needy mothers and their infants. 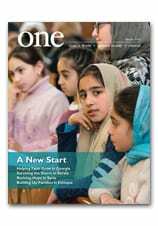 To learn more about the clinic, read our article in the May 2009 issue of ONE, Mothering Mercies. To learn how you can help support the work of the Mother of Mercy Clinic, visit our website.